Many parents with small children like to be able to visit a fitness center to workout. However, they don't want to go to the trouble of hiring an expensive babysitter that may or may not be trustworthy. This is why many parents are choosing fitness centers with childcare right there on the premises. They want to know that their kids are nearby while they spend some time exercising and relieving stress. Discover some other reasons why many parents choose a fitness center with childcare. There are some parents who like to set a good example for their children by showing them the importance of exercise and staying healthy. The child goes to the childcare area in the fitness center and participates in some fun activities while his or her parent uses the time to work out. Both child and parent are benefiting by going to the fitness center together. While parents are working out, a child gets to interact with other children. It's likely that if a parent goes to workout on a regular basis, his or her child will get to know a lot of the kids in the childcare facility. The child may even meet a best friend there! It's healthy for a child to learn how to get along with other children and experience new things. In this way, the childcare facility in a fitness center offers a child some necessary social time. 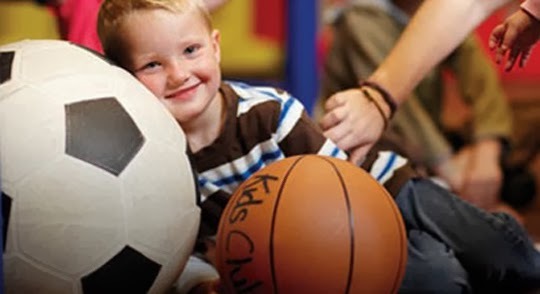 Spectrum Kids Club is one example of this type of childcare facility inside a fitness center.